✦EXTREMEIPAD 10.5 MODEL ADAPTATION -- COO iPad keyboard case,designed for Apple iPad Pro 10.5''/A1701/A1709. Please kindly check before purchase. 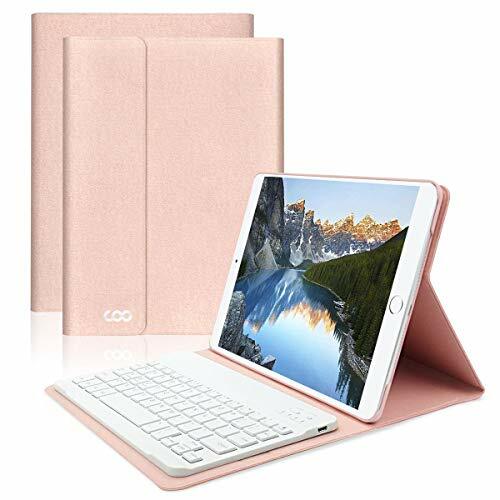 ✦ULTRA SLIM CASE DESIGN -- Magnetically detachable super slim 7mm and light weight bluetooth keyboard with 10M range.And take along in a briefcase, handbag or backpack. ✦EXTREME TYPING EXPERIENCE -- Real "hard" laptop style keyboard with high end ABS material.Our TPU shell is not as cheap as the silicone case in market. A spring mechanism underneath each key ensures a tactile response with every stroke,helping you to type faster and with less error than on a touchscreen. ✦AUTO SLEEP/WAKE FUNCTION -- The iPad tablet screen will be Auto-sleep when close the folio cover. Auto/sleep wake protects and conserves battery life while the durable polyurethane shell with impact-resistant corner and reinforced hinge protects the rest. ✦POWERFUL WIRELESS CONNECTION -- The keyboard owns the stable Bluetooth signal coverage up to 33 feet, 180 hours' continuous operating time and 800 hours' standby time. The full-charge time is less than 2 hours.